Among other places I went to Peru and saw Machu Picchu! The trip back home though was long and boring. There’s lots of ways that one can keep their mind when busy when in a non-stimulating situation though. Reading, Sudoku , cross word puzzles, so on. Sometimes I like playing with code during these times. I had started off reading a math heave book though. I generally have a notebook with me, and my notebooks are generally graph ruled. But graphing polynomials can be tedious. But hey, I had a Chromebook with me, plenty of battery life, and no Internet access. So I decided to see what I could do with the HTML canvas. I cam up with something that worked and was useful. It’s not something that I would package and call a library by any means. After all, this is something that was put together during a layover in an airport. But nonetheless I thought it to be something that is worthy of sharing. and draw a red rectangle in it. Cool, we can draw on the surface. But before graphing anything we need to be able to map the data that we are graphing to the coordinate space for the graph. That’s going to be a linear transformation. Linear transformations are easy but something that I’m sure I’ll want to do several times. So I’ve made a class to figure out the the transformation for me. Given a pair of starting and ending values this class is able to convert from on value range to another. The class has two methods. the map() method will do the conversion and rmap will perform a reverse conversion. Given the the freezing and boiling points of water in Farenheit and Celcius it could perform conversions back and forth between the two. I sat for a while and I thought about the parameters that I would want to pass when creating a graph. I first envisioned passing this information as individual parameters to a function. But I didn’t have to think for long before I realized this would be a lot of parameters most of which I probably would not feel like specifying. I took a slightly different approach and decided to instead pass a parameter object. The object would be initialized with a set of workable default values that could be changed as the graph needed to be customized. Some of the basic information needed is the the size of the graph within the HTML page and the ranges of the X and Y values being displayed. I allow these values to be optionally passed in when constructing the object. I’ve also defined a color palette to be used for the graph. With that we are ready to start creating our graph. We need a way of specifying where in the page the graph should be generated. I’ve made a method named makeGraph() that will accept two arguments; the parent element for the graph and the parameter object for the graph options. If for some reason the parent element isn’t specified the function will just append the graph to the page’s DOM. specify the values in a certain order that’s the solution that I used. The function made for public use on this class ia named plot. It accepts a list of functions to be graphed. While I expect an array of functions to be passed to it if a singular function were passed that’s converted to an array of one function so that it can be treated the same way. The plot function interates through the functions passed through it passing each one to another function that does the actual work. A different color index is passed for each function. The real work is done in plotFunction. First the X-values that fall within the range of the limits of the graph are passed to the function being mapped and the canvas-mapped result is saved to an array. The result for each X-value could either be a number or a non-number. Non-numbers will not be represented in the graph. This allows for the generation of graphs for which there may be X-values that are not part of the functions domain. If an exception occurs when calling the function being graphed the X-value association with that exception is treated as a value for which the function returns nothing. After this first pass we have an array of the canvas-mapped output values from the function. 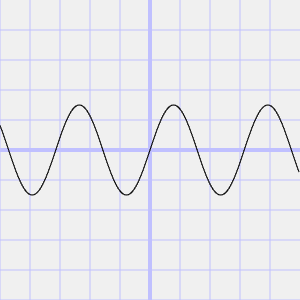 Next we perform the acual rendering of the output onto the graph. The function will scan ahead in the array of results to the first numerical value. This first numerical value may or may not be in the first position of the array. Once a value is found it is used as the first coordinate for a line segment. Each numerical value in the array that follows this is added to the line segment. This continues until either the end of the array is reached or a non-numerical value is encountered. In either case the accumulated points for the line segment are stroked ending. If there are more values within the array the process is repeated until the end of the array is encountered. I’ve made a page with a few place holders for graphs. Among other things it contains the following. Plot of a trajectory height for an object thrown up at 10 m/s near the earth's surface. Here is the result. 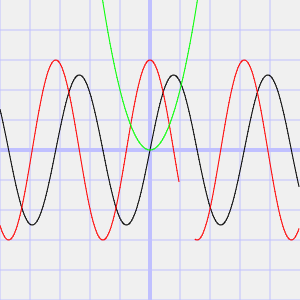 The range for which no value is returned is apparent from the area in which the red line on the graph is not rendered. Awesome! The code works! But now what? Well, nothing for now. This was something I wrote with temporary intentions and to keep myself from being bored. That’s not to say that I’m giving up on developing a graphing library. Once back home I checked online to see what types of other graphing libraries are available. There’s a number of them, each having their own strengths. I have a direction in which I’d like to take this that is different from the others that are out there. I may revisit this, but only after a lot more thought of what I want to do, how I want this to work, and how the variations on graphs can be specified. Kernel filters are a common approach for modifying images for various applications of image processing. They can be used to sharpen an image, blur it, or extract attributes about a picture for further processing. Implementation of the filters is simple and straight forward. I wanted to do some experiments with Kernel filters on my phone. But to my surprise the available options were not many. I decided to make my own. Before developing something for my phone I started off from a browser since my Chromebook was handy. Here I’m sharing the results. Kernels are known by many names. Kernel, convolution matrix, and mask all refer to the same thing. Convolution is the process of adding together the values of neighboring elements of an image and applying some weight to each of the pixels. The weights, or kernel, are often expressed using matrix notation. For each one of the pixels in an image the kernel is applied to the pixel and it’s neighboring pixels to determine the new intensity for the pixel. Visually we see the pixel data as being organized in rows and columns. In memory it is organized in a single dimensional array. To read and write the correct pixel you’ll need to know how it’s organized. A single pixel is composed of 4 numbers; 3 of the numbers are for intensities of red, green, and blue and the fourth number is for transparency. These 4 elements make up a single pixel. Pixel data is usually saved continuously starting with the upper left most pixel of an image as the first one to be encoded and moving to the right from there. Once the end of a row is reached the encoding continues starting with the left most pixel on the next row. Pretend that you had an image that was 10 pixels wide and 10 pixels tall. If you wanted to read from the pixel on the third row and fourth column (keeping in mind that zero based addressing is being used) we would need at least 20 pixels into the array to get to the third row and then another 3 more pixels to get to the fourth column. In other words we need to read the twenty third pixel. Since pixels are composed of four elements this works out to the reading starting with index 92 of the array to get the red portion of the pixel and indices 93, 94, and 95 to read the green, blue, and transparency portions. Given an X and Y coordinate the equation for determining what address to start reading at is as follows. Since the application of the kernel can overlap with pixels that are outside the range of the image I needed to decide how to deal with attempts to read pixels that are outside of range. I could have a constant value returned (like zero for all elements), have the read address wrap around to the other side of the image, or I could cap the read coordinates. I chose to cap the read coordinates. Attempts to read a coordinate that is less than zero will result in coordinate being changed to zero. An attempt to read beyond the edge of the image results in the edge of the image being read. Given an image we need to get the image data from the image into the canvas. The canvas has a method named drawImage that will do this. To apply the filter, we will need to have a structure that contains the source data and another for writing the results. The results cannot be written to the same structure that we are reading from as this would overwrite some of the pixels that still need to be read for other processing. With that in place we can now view the results of various kernel filters. Using the same source image here are a few filters and the result of them being applied. This is the original image that I’ll be working with. or multiplying and dividing by 1.
would be one of your go-to filters. The Embose filter produces an image with a 3d effect making it look like the image has been pressed into a material. Various areas of the image will appear to be raised or depressed. The Box Blur simply averages the pixels in an area together. Here I show a 3×3 filter. For the image shown here I actually used a 10×10 filter for the sake of exagerating the effect to make it more visible here. This gives me something quick I can use for testing out image filters. It could be better though. Right now, to apply a different filter I need to modify code. Wouldn’t it be nice if the filter data were externalized allowing for filters to be saved and shared? I’ll look at that the next time I revisit this project. It took a lot more digging, but I did find the source of this problem. While the video card *did* match requirements the problem was the processor generation. Since it was below the required generation there were some features that were not enabled in the video card drivers. Since some features were not enabled in the video card drivers the video card itself appeared to not meet requirements. I’ve got some Windows Mixed Reality Immersive headsets in hand. The experience is pretty cool. But I wanted to figure out what the minimum requirements are to use them so that we could get new hardware for some of the other developers. Microsoft has minimum requirements listed on a page. Not being one to take such a thing on word value (especially not for a new product) I decided to validate these requirements. The item I was questioning was the video card. The requirements list the NVidia GTX 1050 as the minimum video card. I made my way over to my local Best Buys and picked one up. It was installed into a Machine that already had the Windows 10 Creator’s Update on it. When I started the Mixed Reality application I got the following. I tried several driver versions from the ones released in April (version 381.65, which were the first to have VR support) to the most recent at the time of this writing (385.28). Digging a little deeper I received a rather cryptic message from the NVidia GeForce software on Virtual Reality support. The software told me that this video card didn’t meet requirements for Virtual Reality. I needed to have at least an NVidia GTX 1050, and the card in the machine was only a NVidia GTX 1050. That’s not a typo, it showed the same card for both the required minimum and what was installed. I get the impression that there was the intention to support VR in this card but it just never happened. As of yet the consumer release of the Mixed Reality features has not occurred. We are still in a time frame in which things could change rapidly. This card might be supported by then. From some exchanges with others though of you are looking to get a card that supports the Windows Mixed Reality headsets start of with NVidia’s GTX 1060 as a minimum. I have some down time and spent some of the time to clear the drive on a computer, reinstall Windows, and rebuild my development environment. While I was doing this I decided to try out SpectatorView for the HoloLens. For those unfamiliar SpectatorView is a solution for creating recordings of what one sees through a HoloLens. The HoloLens does have a recording feature built in, but that feature is low resolution. Using SpectatorView one can produce a high resolution recording. Using a high resolution camera mounted to a HoloLens and a video capture a computer takes the motion data stream from the HoloLens to overlay objects from a HoloLens program onto a video stream. I tried it out last week with a 1K camera (Canon 5D Mark III) and it works great! One of the personal goals that I have is that when possible to automate setup steps for a development environment, especially if I may need to do them again. I expect to see a fast return on investment for doing this either through time saved when I seed to setup an environment for myself again or when coworkers are able to save time by being able to use the scripts that I’ve made. Up until now my use of PowerShell has been light, but it looked to be the perfect scripting language for this task. For the most part PowerShell gives access to the COM, WMI, and .Net objects in a scripted environment. To setup SpectatorView there are a number of software components that are needed. Unity and Visual Studio are frequently used within my team, so I’m starting off with the assumption that these two components are already present. Getting the other components is easy enough, so I don’t expect an attempt at scripting the acquisition and installations for it to save much time. But I also feel that initial attempts at scripting are better applied to something simple to allow for problems to be found before being applied to more complex scenarios. The Canon SDK can only be downloaded if someone registers with Canon, requests access to the SDK, and then downloads the SDK after receiving approval to download the SDK. Since there are manual steps involved in getting access to the Canon SDK I did not script the acquisition of the file. Similarly the BlackMagic Decklink SDK also requires registration to download. While I could not script the acquisition of these two files I was still able to handle them post download in my script. Each version of these SDKs have a slightly different name since the version number is a part of the file name. To keep the script easy to use it will figure out the actual name of the file when run. If a new version of one of the SDKs were to be used it would only be necessary to replace the ZIP file being used. The Hololens Companion Kit is the easiest of the components to acquire through a script. It can be downloaded using GIT. So I won’t spend much time talking about how to download it and only mention it at all since it is a necessary component. If you are not familiar with what the Test-Path command means don’t worry about it just yet. I’ll explain it’s use when it is used on another component. Leaving nothing to be ambiguous many of the file locations referenced are relative to the location of the power script file. In PowerScript There is a variable named $PSScriptRoot whose value is the full path to the folder from which the script is run. While not absolutely necessary I build paths to various files and folders using this variable. For downloading the OpenCV source I’ve placed the URLs for OpenCV from one of the mirrors in a variable at the top of my script. If I ever wanted to change the version of OpenCV used I would need to change the value in this variable. There are several ways to download a file in PowerScript. I decided to use .Net’s WebClient because of speed and predictability. I considered using BITS but when using BITS to download you can’t know when the service will get around to downloading the file; it will do so on it’s own schedule. Downloading the file with the WebClient is easy. But it provides no feedback while it works. Just so that someone using the script doesn’t think that something is wrong I decided to print a message letting them know to hold on for a moment. $openCVArchivePath = $openCVFolder + "\archive.exe"
Write-Host "Downloading OpenCV. This is going to take a while..." -foreground "Green"
If you were to take the above and put it in a file with a “ps1” extension and run it you’ll find that a file downloads named archive.exe. OpenCV for Windows is distributed in a self extracting archive (Which is why it uses an EXE extension instead of ZIP). Once the files is downloaded if you were to run it you would be greeted with a prompt asking where you want the file to be extracted. For automating the setup I don’t want the archive to give these prompts. I’ll invoke it passing to it on the command line the location that it should use. Adding those arguments to the above script we end up with the following. This works. But i wanted it to be possible to run this script more than once if it failed for some reason. To prevent the script from reinstalling OpenCV again if it had been installed before I check for the existence of the OpenCV folder. This is a less than thorough test as it would not detect conditions such as an archive being partially unzipped before failing. But this is satisficing for my purposes. The Test-Path< command can be used to determine whether or not a file object exists at some path. I wrapped the above code in a block that checks for the existence of the OpenCV folder first. The BlackMagic and Canon SDKs are both in ZIP files. Unpacking them will be about the same. I’ll only talk about the Canon SDK for a moment. But the there’s equal applicability to what I am about to say to both. Like the OpenCV SDK I’ll check to see if the folder for the Canon SDK exists before trying to unpack it. The script requires that the Canon SDK zip file be in the same folder as the script. The Canon SDK versions all start with the same prefix. They all start with EDSDK. To find the file I use the Get-ChildItem command to get a list of files. If there is more than one version fo teh SDK in the folder sorting the results and taking the last should result in the most recent one being selected. PowerShell allows the use of negative index numbers to address an item from the end of a list. Index -1 will be the last item in the list. Taking the last item and getting its FullName value will give the path to the zip file to be unzipped. The Expand-Archive command will unzip the file to a specified path. The Visual Studio project that is part of the SpectatorView software requires some updates so that it knows where the various SDKs are located. The path to the BlackMagic SDK, Canon SDK, and OpenCV software must be added to it. The dependencies file dependencies.props is an XML file. The Common Language Runtime has classes for manipulating XML files. I use one of these to update this file. The exact path of each component could differ depending on which SDK version is used. Rather than hard code the path I use the Get-ChildItem command again to query for the name of folders. For the CanonSDK the line of script code to get the path looks like the following. There is a little more nesting that occurs with the other two SDKs. But the lines for getting their paths is similar. With those paths populated I now need to load the XML file, update the values, and write them back. The Common Language Runtime’s XML class is available to PowerShell. Given a string that contains XML if that string is cast to [xml] it will be parsed and all the nodes available through its properties. To get the XML string from the contents of the dependencies files the Get-Content command will be used. Given a file path it returns the contents as a string. The script is at the bottom of this post. Running this script doesn’t result in SpectatorView being 100% setup. It is still necessary to go through calibration (a step that requires you to physically do some things) in front of the camera) and copying the libraries from the sample project into your own project. There are opportunities for further automating the setup. But I felt this was a good time to write about what is working at this moment (if I wait until it is perfect ot may never get posted). On occasions I develop for the Gear S2/S3 watches from Samsung. (From a development perspective these watches are nearly identical, so I will collectively refer to them as the Gear S watches). When returning to develop after a period away from them there are a few mistakes that I find I sometimes make. Looking in some support forums I see there are others that make these mistakes too. To both help out others that run into this (and as a note to myself) I’ve made this post to cover some of the checks necessary. Before anything else will work debugging must be enabled on the watch. This setting will be cleared if you’ve done a hard reset on the watch or if you have connected it to a different phone. You can change the setting by navigating to Settings ➜ Gear Info ➜ Debugging and ensure that the setting is checked. You need to know the watch’s IP address to attach to it for debugging and deployment. Remember that the IP address will be different if you go to a different wireless network or could be different if you reconnect to the same network. To see the watch’s IP address navigate to Settings ➜ Connections ➜ Wi-Fi ➜ Wi-Fi networks ➜ select your network ➜ scroll down to the IP address. The watch must be unlocked for the initial connection. While this may be obvious what is less obvious is how quickly the watch can become locked again. The heart rate monitor on the back of the watch also acts as a presence detection sensor; the watch is aware of when it’s been removed from your wrist and will go into a locked state almost immediately if you have a lock code/patter on it. When handling the watch if your finger passes over this sensor the watch may lock. You could unlock the watch, set it down in the cradle, and it could be locked again because of your finger coming close to the sensor. Before opening Tizen Studioconnect to the watch using SDB. From the command line on your computer (or Terminal if you are on a Mac) navigate to the folder that contains Tizen Studio and then into the tools folder inside of it. Type the following substituting your own IP address here. If this is the first time the watch has connected to the machine from which you are typing the command the watch will prompt you to accept an RSA key. If you don’t accept it the connection attempt will fail. Sometimes when you attempt to connect the command line tool will print a failure message the first time even though it has actually connected. Run the command a second time and you’ll get a message that the watch is already connected. You only need to do this if the watch has been reset since the last time you’ve done development on it (or if you’ve never developed on the watch before). Certificate management is a topic of it’s own; I won’t go into it here. Provided that you have a handle on development certificates the above should be enough to get your watch connected to your computer for development. I’ve got a project planned involving Windows IoT for which I need the system to have the correct time. 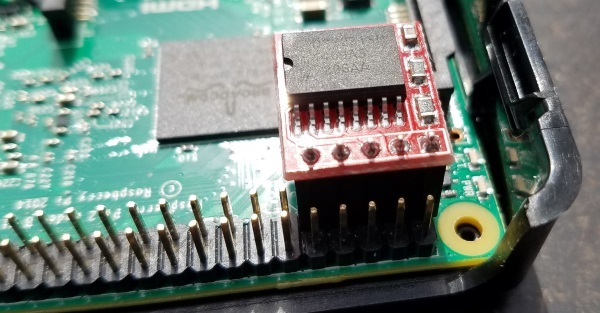 The Raspberry Pi with Windows IoT has no real time clock. It initializes the time over NTP when connected to a network. But when not connected to a network the time will be wrong. It has no support for a real time clock at this point in time. That’s no good. I searched for how people have worked around this. A frequent solution was to add a real time IC and have ones solution communicate directly with the real time chip and ignore the native APIs built around time. I don’t like this solution. I’d like to maintain compatibility with other systems and not make something that is dependent on a specific implementation of a clock. I wanted a way to get the Raspberry Pi to initialize from the RTC instead of NTP.